as many of you know, i have a student teacher, jackie sullivan. she is quite an digital illustrator - but not in the traditional sense. she has been working with the ap students on a digital painting, and i was inspired and did one of my own. the technique is as follows: start with an ink wash painting (b/w). scan it. paint the colors using photoshop and a wacom drawing tablet. add textures (in my case, pieces of my circle paintings and spray paint splatters). tweak. jackie's knowledge of photoshop tricks and techniques was inspiring and excited the students as well as me. 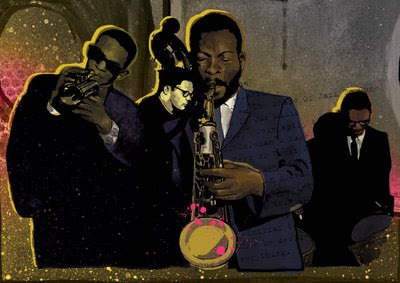 the subject of this painting is the ornette coleman quartet (l-r): don cherry, charlie haden, coleman, and ed blackwell. the title is "the shape of jazz to come". signed and numbered archival digital prints (on rives bfk) are available for sale. contact me for prices.